Listed in this section are the river access points on the south side of the river, the non-Indian Reservation side of the river/reservoir. This 29 mile section of the river below Little Falls Dam to the Columbia River/Lake Roosevelt is know has the Spokane Arm of Lake Roosevelt. It is a popular camping and boating area primarily for power boats, house boats, and sailors. There is a short whitewater section of the river below the Little Falls Dam known by some whitewater kayakers. Below the rapids the river turns into Lake Roosevelt (Spokane Arm). Several amenities are available here including several paved launches and access points, boat fuel available at McCoy's, and Two Rivers Resort where the Spokane River empties into the Columbia River/Lake Roosevelt. The big draw on this portion of the river is Fort Spokane which includes a visitor center, historic museum, campground, launches, and other facilities. The other attractions are the Two Rivers Casino and Resort. Area recently experiencing 20' Tasmanian wave created by a slide that temporarily damaged Porcupine Bay Launch and docks. Strong winds frequent the area to the liking of sailors and not so much to water skiers. 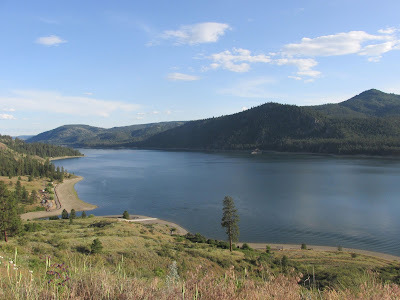 Camping in this area is not only a great experience but also gives you access to Lake Roosevelt with over a 100 miles of navigate-able water. Fishing on this portion of the river is popular. The scenery is also spectacular here due in part to the high mountains. The Grand Coulee Dam creates Lake Roosevelt (reservoir) and the water from this reservoir backs up just 2 miles short of the Little Falls Dam. For reservoir water levels and Grand Coulee Dam information visit http://www.usbr.gov/pn/grandcoulee . For info about Lake Roosevelt recreation, camping, etc. and Fort Spokane visit http://www.nps.gov/laro/index.htm or call 509.633.9441. For boating info and regulations visit http://www.nps.gov/laro/planyourvisit/boating.htm . Directions: State Road 25 follows along the eastern lakeshore, connecting the north district to the south via Fort Spokane and Porcupine Bay. For detailed directions see sections below. This little know landing is a perfect place for kayakers and fishermen with small craft to launch from. There is a gate that blocks trailer launching, but this is easy to get around by those portaging their craft to the water's edge. There is a gradual wide bank from the gravel road to the water. This site includes a pebble beach and gravel parking area in front of the gate. There is no restroom and running water. This landing is directly on the opposite side (south) of the reservoir from Blue Creek campground area. One could boat directly north from this landing to this campground. Directions: From I90 near Ritzville WA. take Exit 232 on E. Danekas Rd going west. Turn right onto N Hills Rd; N Hills Rd. becomes Harrington Tokyo Rd. Turn left onto WA-23/E Sherlock St. Turn right onto S 3rd St./WA-23, then right onto S 3rd. ST/WA-23. South 3rd St./WA-23 becomes WA-28. S 3RD ST/WA-23 becomes WA-28; Turn Right onto Morgan St/US-2. Continue to follow US-2;. Turn right onto Morgan St/US-2. Continue to follow US-2;.Turn left onto WA-25. Turn right onto Porcupine Bay Rd. N, Follow this road directly into the park. Maps: To view a map click on the following link google.com/maps and type Fort Spokane, WA. ACCESSIBILITY: PARKING... Gravel parking along road at gate. Make sure you are far enough off the road so as not to impede traffic. Do not block gate. This is a dead end road; PATHS/TRAILS... Not paved and very primitive. Bank gradually descends to the water at about 5% grade. There is a pebble/rocky beach; RESTROOMS/FACILITIES… None; SENSORY... No sensory tactile markers for those with visual and other impairments. DOCKS/LAUNCHES/PLATFORMS… None; DIRECT WATER ACCESS… No access for wheeled mobility devices; TRANSFER SYSTEMS... None; CAMPING... None; O.T.H.E.R… Oddities/Barriers: Nothing unusual; Terrain: Level to about 5% grade as it descends to the water; H2O/Water: Water normally murky. Water temperature in the summer can be around 60 to 70 degrees. Extreme current can develop in this area. Beware of sudden increases in river/reservoir levels via Dam up river or down the end of the reservoir at Grand Coulee Dam. At late fall and during the winter the reservoir is drawn down and this launch site has no water around launch area. River like conditions at times; Environmental Conditions: Nothing unusual. River like conditions in early spring and late fall; Resources: Food, drinks, and gas at and around Two Rivers Casino and Resort. Porcupine Campground is a beautiful forested park. Amenities include a double paved launch with large parking area, docks, restrooms, running water, beaches, swim area, day use area, and tent and RV campsites. Great place to boat or fish from or head up river towards the Little Falls Dam. Directions: From I90 near Ritzville WA. take Exit 232 on E. Danekas Rd going west. Turn right onto N Hills Rd. (N Hills Rd. becomes Harrington Tokyo Rd.). Turn left onto WA-23/E Sherlock St. Turn right onto S 3rd St./WA-23. Turn right onto S 3rd. ST/WA-23. (S 3rd St./WA-23 becomes WA-28, and S 3RD ST/WA-23 becomes WA-28). Turn right onto Morgan St/US-2. Continue to follow US-2. Turn right onto Morgan St/US-2. Continue to follow US-2. Turn left onto WA-25. Turn right onto Porcupine Bay Rd. N. Turn right onto Laughbon Landing Rd. N. Drive to the end of this road. Maps: To view a map click on the following link google.com/maps and type Fort Spokane, WA. Then follow the directions. ACCESSIBILITY: PARKING... Large paved park lot, with designed accessible and trailer parking spaces; PATHS/TRAILS... Several paved paths to beach and launch area; There is a large sandy beach; RESTROOMS/FACILITIES… Fully accessible restrooms and picnic area, drinking water; SENSORY... No sensory tactile markers for those with visual and other impairments. DOCKS/LAUNCHES/PLATFORMS… Three docks, two on either side of the double lane launch, and one at near launch for those staying at the park; DIRECT WATER ACCESS… No access for wheeled mobility devices. With assistance one utilizing a wheelchair could get to the water at the beach, depending on water level; TRANSFER SYSTEMS... None; CAMPING... Tent and RV camping; O.T.H.E.R… Oddities/Barriers: Nothing unusual; Terrain: Level to about 5% grade at launches; H2O/Water: Water normally murky. Water temperature in the summer can be around 60 to 70 degrees. Extreme current can develop in this area. Beware of sudden increases in river/reservoir levels via Dam up river or down the end of the reservoir at Grand Coulee Dam. At late fall and during the winter the reservoir is drawn down so beach access is an issue. Due to the length of the powerboat launch pad there typically is water at the end of the launch pad. River like conditions at times; Environmental Conditions: Nothing unusual. River like conditions in early spring and late fall; Resources: Food, drinks, and gas at and around Two Rivers Casino and Resort. ACCESSIBILITY: PARKING... Large paved park lots, with designed accessible and trailer parking spaces; PATHS/TRAILS... Several paved and hard packed gravel paths to the launch beaches. At powerboat launch there there is a paved route to the launch dock. Trails to the beaches are level to about 4% grades. Route path to powerboat launch dock is about 5% grade; RESTROOMS/FACILITIES… Fully accessible restrooms at powerboat launch and beach launch areas. There are accessible picnic areas, drinking water, etc. ; SENSORY... No sensory tactile markers for those with visual and other impairments. DOCKS/LAUNCHES/PLATFORMS… Four docks, one at powerboat launch, and three at camping area beach launches; DIRECT WATER ACCESS… No access for wheeled mobility devices. With assistance one utilizing a wheelchair could get to the water at the beach, depending on water level; TRANSFER SYSTEMS... None; CAMPING... Tent and RV camping; O.T.H.E.R… Oddities/Barriers: Nothing unusual. Lots of sand, dust, and mud during the rainy season; Terrain: Level to about 5% grade at launches; H2O/Water: Water normally murky. Water temperature in the summer can be around 60 to 70 degrees. Extreme current can develop in this area. Beware of sudden increases in river/reservoir levels via Dam up river or down the end of the reservoir at Grand Coulee Dam. At late fall and during the winter the reservoir is drawn down so beach access is an issue. Due to the length of the powerboat launch pad there typically is water at the end of the launch pad. River like conditions at times; Environmental Conditions: Nothing unusual. River like conditions in early spring and late fall; Resources: Food, drinks, and gas at and around Two Rivers Casino and Resort. All three of these river side campsites are boat in only. NOTICE: If someone tells you Detillion campsite (located east from the Fort Spokane Launch/Park) can be accessed via vehicle, they are incorrect. Access to Detillion is blocked by a private ranch. This is a boat in only site. ACCESSIBILITY: PARKING... Park at Fort Spokane State Park Boat Launch facility; PATHS/TRAILS... Designed path to boat launch dock. At riverside campsites there are primitive trails from the water to the campsites. Any trails are sandy/dirt combo. Not considered accessible for wheeled mobility devices; RESTROOMS/FACILITIES… None; SENSORY... No sensory tactile markers for those with visual and other impairments. DOCKS/LAUNCHES/PLATFORMS… One dock and double lane paved boat launch at Fort Spokane S.P.. No docks at riverside campsites; DIRECT WATER ACCESS… No access for wheeled mobility devices; TRANSFER SYSTEMS... None; CAMPING... Primitive camping at designated riverside campsites. Most of these campsites are in wooded areas with shade; O.T.H.E.R… Oddities/Barriers: Lots of sand; Terrain: Level to about 3% grades; H2O/Water: Water normally murky. Water temperature in the summer can be around 60 to 70 degrees. Extreme current can develop in this area. Beware of sudden increases in river/reservoir levels via Dam up river or down the end of the reservoir at Grand Coulee Dam. At late fall and during the winter the reservoir is drawn down and these beach sites can be difficult to get up to from the water. River like conditions at times; Environmental Conditions: Nothing unusual. River like conditions in early spring and late fall; Resources: Food, drinks, and gas at and around Two Rivers Casino and Resort. Wynecoop Access point is less than 2 miles below the dam. This is the only river access point below the Little Falls Dam before it slows and turns into a reservoir. It has an old paved launch that can be difficult to use because of the mound of dirt and rock in front of it. Be advised that if you could back at trailer down this launch this ramp drops off abruptly and you could potentially drop your trailer wheels off the pad and get stuck. However next to this ramp is a primitive gravel launch that gradually descends into the river and is much better suited for launching. There are no restrooms or running water, and camping is not allowed. The road to this river launch is to the left before the sign on road that says "No Trespassing, This is not a public road. Strictly Enforced." This site is regularly used by the locals. The gravel road nearest the sign is a private drive. Directions: Traveling north or south on HWY 231 when you are near the Spokane River turn left onto Little Falls Rd. E. When this road descends to the Spokane River and you proceed past Little Falls Dam, turn left onto Wynecoop-Cayuse Mtn Rd. Follow this road to where a sign says "No Trespassing, This is not a public road. Strictly Enforced." Turn left on the second gravel road prior to reaching the sign (you can see the sign from the gravel road) and on the other side of the road from the sign. The gravel road nearest the sign and across the street is a private residence road. Maps: To view a map click on the following link google.com/maps and type Fort Spokane, WA. Follow the directions to Fort Spokane, then continue on across the river/bridge and continue to follow the directions as indicated above. ACCESSIBILITY: PARKING... Gravel parking next to either the gravel or cement launch. Do not block launches or road two and from these sites. This is a dead end road; PATHS/TRAILS... None; RESTROOMS/FACILITIES… None; SENSORY... No sensory tactile markers for those with visual and other impairments. DOCKS/LAUNCHES/PLATFORMS… One paved and one gravel launch; DIRECT WATER ACCESS… No access for wheeled mobility devices; TRANSFER SYSTEMS... None; CAMPING... None; O.T.H.E.R… Oddities/Barriers: Nothing unusual; Terrain: Level to about 7% grade as it descends to the water; H2O/Water: Water normally clear. Water temperature in the summer can be around 60 to 70 degrees. Extreme current can develop in this area. Beware of sudden increases in river levels via Little Falls Dam up river. At late fall and during the winter the river is drawn down and these launch site have little water to launch into launch. River like conditions at times; Environmental Conditions: Nothing unusual. River like conditions in early spring and late fall; Resources: Food, drinks, and gas at and around Two Rivers Casino and Resort. Blue Creek Campground is posted as a tribal campground only, but many non-tribal members camp here. Contact the Spokane Indian Tribe about the current status of this site for non-tribal members. This location is particularly known as the area that kayaker like to camp at before going up river toward the Little Falls Dam. Porcupine Campground across the river/reservoir is a good alternative campsite but can be very congested during the summer. This site has only a few shaded locations to camp at unless you drive further up the dirt road and then hike a little into the trees in the gulch. There is no formal launch so one launches non-motorized watercrafts off the banks/sandy beaches. This creek has created one of the few bays on this section of the river/reservoir where one can anchor a boat to get out of the main channel from boats and bad weather. There is a large level grassy area to play sports, Frisbee, etc. on. Restrooms are poorly maintained and are not wheelchair accessible. Be advised that the Blue Creek Rd., which leads down to the river/reservoir, dead ends at the bay area, and does not lead back to the main road as indicated on most maps. Also this road is very steep but less so than the other campground roads in this area. Unfortunately the dirt road has a lot of ruts and loose rocks that make the trip down to the river/reservoir a bit difficult. If you are pulling a trailer it's best to have a vehicle with 4x4 that has the power to go up 6% grades with areas of sand, loose small boulders and rock, and gravel. Directions: From I90 near Ritzville WA. take Exit 232 on E. Danekas Rd going west. Turn right onto N Hills Rd (N Hills Rd. becomes Harrington Tokyo R); Turn Left onto WA-23/E Sherlock St; Turn Right onto S 3rd St./WA-23; Turn Right onto S 3rd (ST/WA-23. S 3rd St./WA-23 becomes WA-28. S 3RD) (ST/WA-23 becomes WA-28); Turn Right onto Morgan St/US-2; Continue to follow US-2; Turn Right onto Morgan St/US-2; Continue to follow US-2; Turn Left onto (HWY) WA-25. Cross the HWY 25 bridge and continue up the hill toward Fruitland & Kettle Falls. Turn right onto Peters Rd. stay on this road until it T's into West-end Rd. Turn right onto West-end Rd. On this road keep an eye out for the wood sign that says Blue Creek Campground (Sign indicates this site is only for tribal members, so again contact the tribe for the current status of this site). As you pass the sign continue on down the road to the river/reservoir. Maps: To view a map click on the following link google.com/maps and type Fort Spokane, WA. Follow the directions to Fort Spokane, then continue on across the river/bridge and continue to follow the directions as indicated above. ACCESSIBILITY: PARKING... Gravel and dirt parking areas in the fields; PATHS/TRAILS... None; RESTROOMS/FACILITIES… One poorly maintained and not accessible to wheeled mobility devices. We advice you bring your own porta-potty; SENSORY... No sensory tactile markers for those with visual and other impairments. DOCKS/LAUNCHES/PLATFORMS… None; DIRECT WATER ACCESS… No access for wheeled mobility devices; TRANSFER SYSTEMS... None; CAMPING... Primitive camping in open field, with only a few trees; O.T.H.E.R… Oddities/Barriers: Nothing unusual. Lots of sand; Terrain: Level to about 5% grade descending into the water; H2O/Water: Water normally murky. Water temperature in the summer can be around 60 to 70 degrees. Extreme current can develop in this area. Beware of sudden increases in river/reservoir levels via Dam up river or down the end of the reservoir at Grand Coulee Dam. At late fall and during the winter the reservoir is drawn down. River like conditions at times; Environmental Conditions: Nothing unusual. River like conditions in early spring and late fall; Resources: Food, drinks, and gas at and around Two Rivers Casino and Resort. All these campgrounds have sandy beaches but none of them have a boat launch. Raccoon Cove is furthest northwest then in succession going southeast is Maggie Shoup's, then No Name, and last Sandy Beach. Raccoon Cove is spot that is most scenic with its rock formations and is nestled in a canon like location. It's also a more popular spot to swim due to the more protected nature of the cove. There is one dock at the No Name campground and a swim dock/platform at Raccoon Cove. At these sites there are many spots where one can tent or RV camp (no hook ups). There are shaded and non-shaded camping areas. Restrooms are poorly maintained and are not wheelchair accessible. Be advised that the roads that lead down to the river/reservoir are very steep. If you are pulling a trailer its best to have a vehicle with 4x4 that has the power to go up 6% grades with areas of sand and loose gravel. Directions: From I90 near Ritzville WA. take Exit 232 on E. Danekas Rd going west on this road. Turn Right onto N Hills Rd; N Hills Rd. becomes Harrington Tokyo Rd; Turn Left onto WA-23/E Sherlock St; Turn Right onto S 3rd St./WA-23; Turn Right onto S 3rd; ST/WA-23. S 3rd St./WA-23 becomes WA-28. S 3RD ST/WA-23 becomes WA-28; Turn Right onto Morgan St/US-2; Continue to follow US-2; Turn Right onto Morgan St/US-2; Continue to follow US-2; Turn Left onto (HWY) WA-25. Cross the HWY 25 bridge and continue up the hill toward Fruitland & Kettle Falls. Turn right onto Peters Rd. stay on this road until it T's into West-end Rd. Turn right onto West-end Rd. On this road keep an eye out for the one wood sign that says Campground, Chief Three Mountain, Raccoon Cove, Maggie Shoupe, No Name (Sandy Creek is not on the sign). As you pass the sign and the road curves to the left stay left and continue on down the hill. Raccoon Cove and Maggie Shoup's is on a dirty road to the left has you go down the hill, and No Name and Sandy Creek are further down the dirt road as you pass the dirty road to Raccoon Cove. Maps: To view a map click on the following link google.com/maps and type Fort Spokane, WA. US. Then follow the directions to Fort Spokane, then continue on across the river/bridge and continue to follow the directions as indicated above. ACCESSIBILITY: PARKING... Gravel and dirt parking areas along dirt/sand road way; PATHS/TRAILS... None. Any trails are sandy; RESTROOMS/FACILITIES… One poorly maintained and not accessible to wheeled mobility devices. We advice you bring your own porta-potty. Several covered picnic/camping sites; SENSORY... No sensory tactile markers for those with visual and other impairments. DOCKS/LAUNCHES/PLATFORMS… One dock and one swim platform. Launch from beach; DIRECT WATER ACCESS… No access for wheeled mobility devices; TRANSFER SYSTEMS... None; CAMPING... Primitive camping along reservoir, with only a few trees; O.T.H.E.R… Oddities/Barriers: Lots of sand; Terrain: Level to about 5% grade descending into the water. Dirty roads down from the main paved road of Peters Rd. are extremely steep at time of 7% or more; H2O/Water: Water normally murky. Water temperature in the summer can be around 60 to 70 degrees. Extreme current can develop in this area. Beware of sudden increases in river/reservoir levels via Dam up river or down the end of the reservoir at Grand Coulee Dam. At late fall and during the winter the reservoir is drawn down and these launch/beach sites can be difficult to get down to the water. River like conditions at times; Environmental Conditions: Nothing unusual. River like conditions in early spring and late fall; Resources: Food, drinks, and gas at and around Two Rivers Casino and Resort. This camp area has no launch but does have extensive beautiful sandy beaches. At this site there are many spots where one can tent or RV camp (no hook ups). There are shaded and non-shaded camping areas. Restrooms are poorly maintained and are not wheelchair accessible. Be advised that the roads that lead down to the river/reservoir are very steep at 7% grade or so. If you are pulling a trailer it's best to have a vehicle with 4x4 that has the power to go up 7% grades with areas of sand and loose gravel. Directions: From I90 near Ritzville WA. take Exit 232 on E. Danekas Rd going west. Turn Right onto N Hills Rd (N Hills Rd. becomes Harrington Tokyo Rd); Turn Left onto WA-23/E Sherlock St; Turn Right onto S 3rd St./WA-23; Turn Right onto S 3rd (ST/WA-23. S 3rd St./WA-23 becomes WA-28). (S 3RD ST/WA-23 becomes WA-28); Turn Right onto Morgan St/US-2; Continue to follow US-2; Turn Right onto Morgan St/US-2; Continue to follow US-2; Turn Left onto (HWY) WA-25. Cross the HWY 25 bridge and continue up the hill toward Fruitland & Kettle Falls. Turn right onto Peters Rd. stay on this road until it T's into West-end Rd. Turn right onto West-end Rd. On this road keep an eye out for the one wood sign that says Campgrounds, Hidden Beach, Hole in the Wall, Horeshoe Point, & Spokane River. Maps: To view a map click on the following link google.com/maps and type Fort Spokane, WA. US. Then follow the directions to Fort Spokane, then continue on across the river/bridge and continue to follow the directions as indicated above. ACCESSIBILITY: PARKING... Gravel and dirt parking areas along dirt/sand road way; PATHS/TRAILS... None. Any trails are sandy; RESTROOMS/FACILITIES… One poorly maintained and not accessible to wheeled mobility devices. We advice you bring your own porta-potty. Several covered picnic/camping sites; SENSORY... No sensory tactile markers for those with visual and other impairments. DOCKS/LAUNCHES/PLATFORMS… None. Launch from beach; DIRECT WATER ACCESS… No access for wheeled mobility devices; TRANSFER SYSTEMS... None; CAMPING... Primitive camping along reservoir, with only a few trees; O.T.H.E.R… Oddities/Barriers: Lots of sand; Terrain: Level to about 5% grade descending into the water. Dirty roads down from the main paved road of Peters Rd. are extremely steep at time of 7% or more; H2O/Water: Water normally murky. Water temperature in the summer can be around 60 to 70 degrees. Extreme current can develop in this area. Beware of sudden increases in river/reservoir levels via Dam up river or down the end of the reservoir at Grand Coulee Dam. At late fall and during the winter the reservoir is drawn down and these launch/beach sites can be difficult to get down to the water. River like conditions at times; Environmental Conditions: Nothing unusual. River like conditions in early spring and late fall; Resources: Food, drinks, and gas at and around Two Rivers Casino and Resort. Lower Spokane River/Reservoir Beach Access campground and Hidden Beaches campground are connected from northwest to southeast with one long sandy beach No official launch, beach launching. There is one dock at the southeast end of Hidden Beach. At this site there are many shaded and non-shaded areas where one can tent or RV camp (no hook ups). Restrooms are poorly maintained and are not wheelchair accessible. Be advised that the roads that lead down to the river/reservoir are very steep. If you are pulling a trailer it's best to have a vehicle with 4x4 that has the power to go up 7% grades with areas of sand and loose gravel. Directions: From I90 near Ritzville WA. take Exit 232 on E. Danekas Rd heading west. Turn right onto N Hills Rd. North Hills Rd. becomes Harrington Tokyo Rd. Turn left onto WA-23/E Sherlock St. Turn right onto S 3rd St./WA-23. (S 3rd St./WA-23 becomes WA-28.) Turn right onto Morgan St/US-2. Continue to follow US-2. Turn right onto Morgan St/US-2. Continue to follow US-2. Turn left onto (HWY) WA-25. Cross the HWY 25 bridge and continue up the hill toward Fruitland & Kettle Falls. Turn right onto Peters Rd. Stay on this road until it T's into West-end Rd. Turn right onto West-end Rd. On this road keep an eye out for the wood sign that says Campgrounds, Hidden Beach, Hole in the Wall, Horeshoe Point, & Spokane River. Maps: To view a map click on the following link http://www.mapquest.com and type Fort Spokane, WA., then follow the directions to Fort Spokane. Continue on across the river/bridge and continue to follow the directions as indicated above. ACCESSIBILITY: PARKING... Gravel and dirt parking areas along dirt/sand road way; PATHS/TRAILS... None. Any trails are sandy; RESTROOMS/FACILITIES… One poorly maintained and not accessible to wheeled mobility devices. We advice you bring your own porta-potty. Several covered picnic/camping sites; SENSORY... No sensory tactile markers for those with visual and other impairments. DOCKS/LAUNCHES/PLATFORMS… One dock. Launch from beach; DIRECT WATER ACCESS… No access for wheeled mobility devices; TRANSFER SYSTEMS... None; CAMPING... Primitive camping along reservoir, with only a few trees; O.T.H.E.R… Oddities/Barriers: Lots of sand; Terrain: Level to about 5% grade descending into the water. Dirty roads down from the main paved road of Peters Rd. are extremely steep at time of 7% or more; H2O/Water: Water normally murky. Water temperature in the summer can be around 60 to 70 degrees. Extreme current can develop in this area. Beware of sudden increases in river/reservoir levels via Dam up river or down the end of the reservoir at Grand Coulee Dam. At late fall and during the winter the reservoir is drawn down and these launch/beach sites can be difficult to get down to the water. River like conditions at times; Environmental Conditions: Nothing unusual. River like conditions in early spring and late fall; Resources: Food, drinks, and gas at and around Two Rivers Casino and Resort. 12. Cornelius Campground & LaunchAt Cornelius primitive campground there is a primitive boat launch suitable for small lightweight powerboats, etc. This is the only launch on the Spokane arm of Lake Roosevelt along the Spokane Indian Reservation. At this site there are many spots where one can tent or RV camp. There are both shaded and non-shaded camping areas. Restrooms are poorly maintained and are not wheelchair accessible. There are beautiful sandy beaches ideal for sunbathing and other activities. Be advised that the roads that lead down to the river/reservoir are very steep. If you are pulling a trailer it's best to have a vehicle with 4x4 that has the power to go up 7% grades with areas of sand and loose gravel. Directions: From I90 near Ritzville WA. take Exit 232 on E. Danekas Rd going west. Turn right onto N Hills Rd; N Hills Rd. becomes Harrington Tokyo Rd. Turn left onto WA-23/E Sherlock St.Turn right onto S 3rd St./WA-23. Turn right onto S 3rd; ST/WA-23. S 3rd St./WA-23 becomes WA-28. S 3RD ST/WA-23 becomes WA-28. Turn right onto Morgan St/US-2. Continue to follow US-2. Turn right onto Morgan St/US-2. Continue to follow US-2. Turn left onto (HWY) WA-25. Cross the HWY 25 bridge and continue up the hill toward Fruitland & Kettle Falls. Turn right onto Peters Rd.. Stay on this road until it T's into West-end Rd. Turn right onto West-end Rd. On this road keep an eye out for the wood Cornelius Campground sign. Maps: To view a map click on the following link google.com/maps and type Fort Spokane, WA. US. Follow the directions to Fort Spokane, then continue on across the river/bridge and continue to follow the directions as indicated above. ACCESSIBILITY: PARKING... Gravel and dirt parking areas along dirt/sand road way; PATHS/TRAILS... None. Any trails are sandy; RESTROOMS/FACILITIES… One poorly maintained and not accessible to wheeled mobility devices. We advice you bring your own porta-potty. Several covered picnic/camping sites; SENSORY... No sensory tactile markers for those with visual and other impairments. DOCKS/LAUNCHES/PLATFORMS… No docks. One sandy launch suitable only for light weight boats; DIRECT WATER ACCESS… No access for wheeled mobility devices; TRANSFER SYSTEMS... None; CAMPING... Primitive camping along reservoir, with only a few trees; O.T.H.E.R… Oddities/Barriers: Lots of sand; Terrain: Level to about 5% grade descending into the water. Dirty roads down from the main paved road of Peters Rd. are extremely steep at time of 7% or more; H2O/Water: Water normally murky. Water temperature in the summer can be around 60 to 70 degrees. Extreme current can develop in this area. Beware of sudden increases in river/reservoir levels via Dam up river or down the end of the reservoir at Grand Coulee Dam. At late fall and during the winter the reservoir is drawn down and these launch/beach sites can be difficult to get down to the water. River like conditions at times; Environmental Conditions: Nothing unusual. River like conditions in early spring and late fall; Resources: Food, drinks, and gas at and around Two Rivers Casino and Resort. This seasonal resort on the Spokane Indian Tribe Reservation is open from Memorial Day to Labor day (if open at all). Besides Two Rivers Resort this is the only place on the Spokane River portion of Lake Roosevelt with fuel for boats (if open). There is a small store, day use area, and beach. This site has docks, beach, shaded area, restrooms, running water, and picnic area. No formal launch. Directions: From I90 near Ritzville WA. take Exit 232 on E. Danekas Rd going west on this road. Turn Right onto N Hills Rd. N Hills Rd. becomes Harrington Tokyo Rd. Turn left onto WA-23/E Sherlock St. Turn right onto S 3rd St./WA-23. Turn right onto S 3rd (ST/WA-23. S 3rd St./WA-23 becomes WA-28). Turn right onto Morgan St/US-2. Continue to follow US-2. Turn right onto Morgan St/US-2. Continue to follow US-2. Turn left onto (HWY) WA-25. Cross the HWY 25 bridge and continue up the hill toward Fruitland & Kettle Falls. Turn right onto Peters Rd. Stay on this road for almost 5 miles. On the right side of road 631/Mccoy Marina Rd, you will see a wood sign indicating McCoys Resort. This sign is right after the Pierre Point Campground sign (a private water side camp area for tribe members only). Maps: To view a map click on the following link http://www.mapquest.com and type Fort Spokane, WA. Follow the directions to Fort Spokane, then continue on across the river/bridge and continue to follow the directions as indicated above. ACCESSIBILITY: PARKING... Gravel and dirt parking area at store; PATHS/TRAILS... None. Open walking spaces around the store and to beach are dirt and sandy; RESTROOMS/FACILITIES… Non accessible restroom in store (only available if open); SENSORY... No sensory tactile markers for those with visual and other impairments. DOCKS/LAUNCHES/PLATFORMS… One dock and beach to launch from; DIRECT WATER ACCESS… No access for wheeled mobility devices; TRANSFER SYSTEMS... None; CAMPING... None; O.T.H.E.R… Oddities/Barriers: Lots of sand; Terrain: Level to about 5% grade descending into the water. Dirty roads down from the main paved road of Peters Rd. are steep at time of 5%; H2O/Water: Water normally murky. Water temperature in the summer can be around 60 to 70 degrees. Extreme current can develop in this area. Beware of sudden increases in river/reservoir levels via Dam up river or down the end of the reservoir at Grand Coulee Dam. At late fall and during the winter the reservoir is drawn down and this beach sites can be difficult to get down to the water. River like conditions at times; Environmental Conditions: Nothing unusual. River like conditions in early spring and late fall; Resources: Snakes, drinks, and gas at at this store otherwise one must go to Two Rivers Casino and Resort. Two Rivers Casino & Resort on the Spokane Indian Reservation is the only marina on lower Spokane River/Reservoir (part of Lake Roosevelt). With 660 miles of shoreline where the Spokane and Columbia Rivers meet, it's an ideal place for water skiing, wake boarding, boating, sailing, fishing or just lounging on the beach. One million visitors per year can't be wrong. The Resort has 101 RV sites and 32 tent sites with beautiful views of Lake Roosevelt and Spokane River Reservoir. All RV sites are full hook-ups equipped with a barbecue, picnic table, and patio. In addition there are restrooms, showers, laundry facilities, pavilion, day use areas, playgrounds, and dump station. Call 509.722.5500 for more information or send an email to vacations@two-rivers-casino.com for reservation information. Visit their website at http://www.two-rivers-casino.com Directions: From I90 near Ritzville WA. take Exit 232 on E. Danekas Rd going west. Turn right onto N Hills Rd. (N Hills Rd. becomes Harrington Tokyo Rd.). Turn left onto WA-23/E Sherlock St. Turn right onto S 3rd St./WA-23 (S 3rd St./WA-23 becomes WA-28.) Turn right onto Morgan St/US-2. Continue to follow US-2. Turn right onto Morgan St/US-2. Continue to follow US-2. Turn left onto WA-25. Cross the HWY 25 bridge and once across the resort is to your left (easy to see). Maps: To view a map click on the following link google.com/maps and type Fort Spokane, WA., then follow the directions for Fort Spokane. Directly across the river/bridge is the resort on the map. ACCESSIBILITY: PARKING... Large paved park lots, with designed accessible and trailer parking spaces; PATHS/TRAILS... Several paved and hard packed gravel paths to the launch and beaches. At powerboat launch there there is a paved route to the launch dock. Trails to the beaches are level to about 4% grades. Route path to powerboat launch dock is about 5% grade; RESTROOMS/FACILITIES… Fully accessible restrooms at powerboat launch and beach launch areas. There are accessible picnic areas, drinking water, etc. ; SENSORY... No sensory tactile markers for those with visual and other impairments. DOCKS/LAUNCHES/PLATFORMS… Marine and dock at launch. No dock at beach area; DIRECT WATER ACCESS… No access for wheeled mobility devices. With assistance one utilizing a wheelchair could get to the water at the beach, depending on water level; TRANSFER SYSTEMS... None; CAMPING... Tent and RV camping with hook ups; O.T.H.E.R… Oddities/Barriers: Nothing unusual; Terrain: Level to about 5% grades; H2O/Water: Water normally murky. Water temperature in the summer can be around 60 to 70 degrees. Extreme current can develop in this area. Beware of sudden increases in river/reservoir levels via Dam up river or down the end of the reservoir at Grand Coulee Dam. At late fall and during the winter the reservoir is drawn down so beach access is an issue. Due to the length of the powerboat launch pad there typically is water at the end of the launch pad. River like conditions at times; Environmental Conditions: Nothing unusual. River like conditions in early spring and late fall; Resources: Food, drinks, and gas at Two Rivers Casino and Resort facilities.